Question: Why is Adam Vognild smiling in ski photos? Are we to believe he actually likes this nonsense? 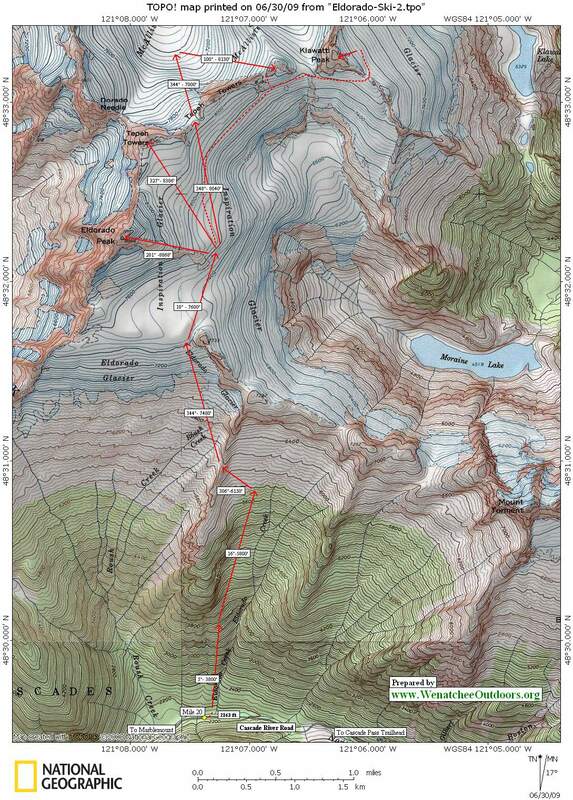 Below is a map that Lowell Skoog prepared of the tour and here is a link to Lowell’s well written article on the Isolation Traverse (his website is a gold mine for anyone who enjoys the Cascade Mountains and rich history). In the mid 1970’s I was fortunate to have been part of a group lead by Joe Firey on an overnight ski tour in the Boston Basin region. 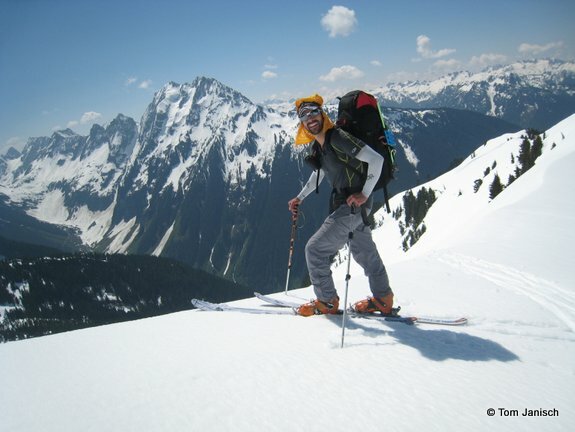 Joe talked about fine skiing in the Eldorado Peak area. Decades later I tagged along with Andy Dappen for a day ski trip of Eldorado Peak (pictured to the right). 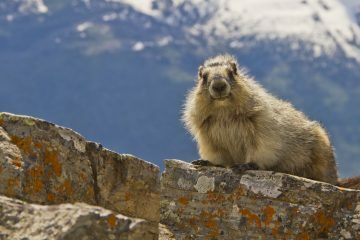 Several years ago, a group of us had a fine outing in the Snowfield Peak region. 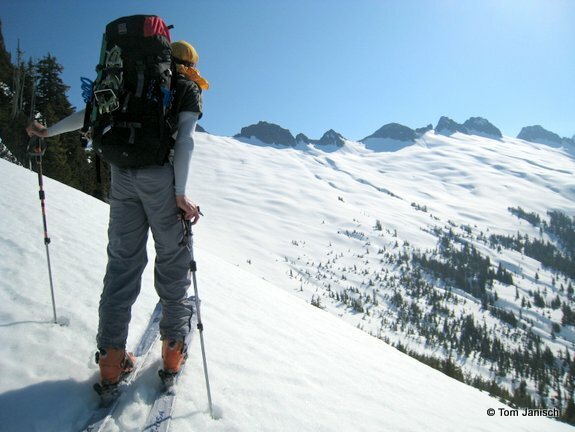 Eldorado Peak and the Snowfield Peak region are the book ends of the Isolation Traverse. The country between is truly isolated and highly recommended. So when Adam suggested a ski of the Isolation Traverse I was on board. We started the first day on the standard approach to Eldorado Peak from the Cascade River Road at 2,160 feet. 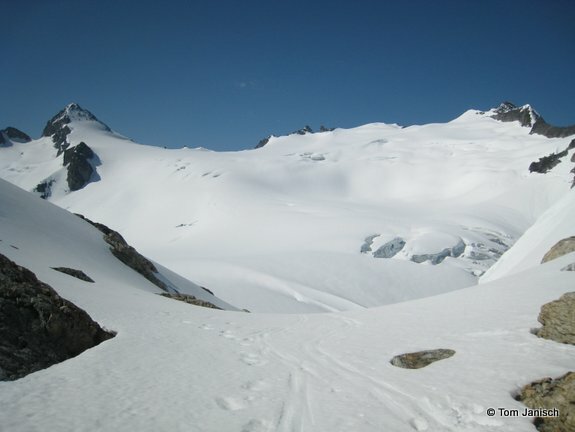 At about 4,200 feet, we hit continuous snow and transitioned to skinning and worked our way across the Eldorado Glacier, across the east ridge of Eldorado, the Inspiration Glacier, and the McAllister Glacier to a rock notch north of Dorado Needle. From here, a short rappel lead us to the east slopes of Backbone Ridge. We set up camp at about 8,300 feet. We looked forward to relaxing in the evening sun and enjoying the sun set. But the maritime air had other plans as clouds enveloped us. Thankfully, by morning the skies had cleared and we were treated to spectacular mountain views. Next came a mile long descending traverse along Backbone Ridge to about 6,000 feet. This was particularly spectacular and memorable. 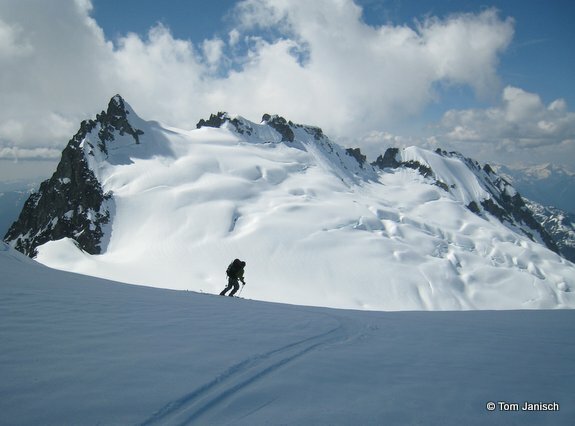 From there, we skied the southwest ridge of the Coccyx and down into the head of Newhalem Creek. Then we skinned up to the entrance to the Ice-elation Couloir which is a nice 1,500 vertical foot run at an average slope angle of 35 degrees (pictured right) Unfortunately for us, in the morning sun we dubbed it the slush-elation couloir. We then skinned and booted over the northeast ridge of Isolation Peak (Point 7102 on the map). We found a scenic rock and heather bench to relax on in the late afternoon sun. Refreshed, we skied a steep run to a small unnamed frozen lake at 5,720 feet. Then we skinned to a bench on the southwest side of Snowfield peak and set up camp at 6,640 feet. We were treated to pretty evening light. 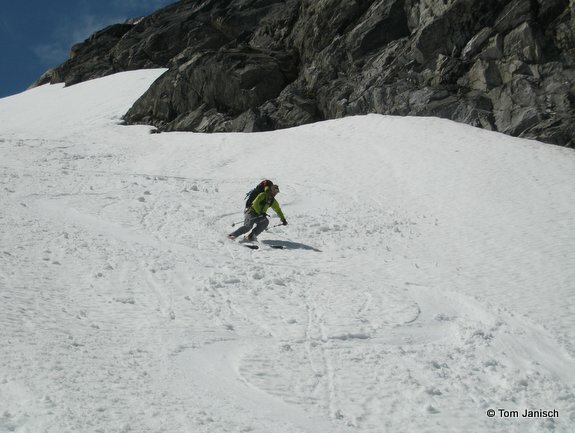 The next morning we ascended to a col between the Horseman and Snowfield Peak at 7680 feet. We then had delightful skiing across the Neve and Colonial Glaciers. At about 4,100 feet, we booted down to the Pyramid Lake trail and a car left on Highway 20. Adam said as we crossed a log across the north fork of the Cascade River that a great adventure has three parts: a worthy objective; an uncertain outcome; and a good partner. It was a great adventure because I had all three! Map: Isolation Traverse Topo. Here is a detailed topo to the Eldorado Peak area. Access. Drive Highway 20 to Marblemount; then follow the Cascade River Road east. Park in a large parking lot on your left (south) about 100 yards past Milepost 20. Park another car at the trailhead for Pyramid Lake (roughly 0.8 miles east of the bridge across Gorge Lake and roughly a mile west of the Diablo Dam) at Milepost 126.8. Park on the north side of the road — the trailhead is on the opposite side of the highway. You’ll be walking down this trail when you come down out of the highcountry near Pyramid Peak. Trip Instructions. Use the guidebook post for Eldorado Peak to start the route. This link to a story by Jason Hummel has info for piecing together the route and SPECTACULAR photos. Leave It Better Than You Found It: This should be every outdoor user’s goal. Remove all your trash and pick-up trash left by others.